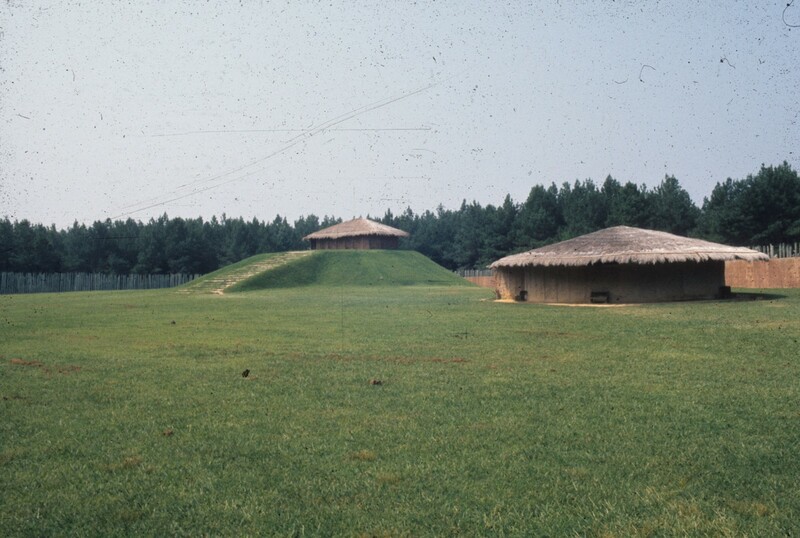 Although inhabited for several thousand years, the major occupation at the Town Creek site, Montgomery Co., was during the 15th and 15th centuries A.D. At that time, the site served as a major ceremonial center of the Pee Dee culture. It is thought that these peoples were Muskogean-speakers who moved north into the Pee Dee River valley from the South Carolina area. The ceremonial center occupation was relatively short-lived, however, lasting only about 100 years. The features at Town Creek included an earthen mound and temple, a priest's house and a mortuary house. Several smaller sites have been recorded in the general vicinity of Town Creek and may have been associated farmsteads and communities. It is believed that the inhabitants of these outlying settlements came to Town Creek for important religious, political and social occasions. Excavations at the site began in 1937 under the direction of Dr. Joffre L. Coe and have continued at various times to the present day. The main ceremonial center at Town Creek has been partially reconstructed and is now a State Historic Site. The site is open to the public Tuesday through Sunday. The Town Creek Site was listed in the National Register of Historic Places and designated a National Historic Landmark on October 15, 1966.